Arthur Ernest Pearce was a modeller and designer of ceramics and terracotta with Doulton & Co 's Lambeth studios. He studied at South Kensington Art School in London and at Julien's atelier in Paris, before becoming a clerk at Doulton's factory in Lambeth. Whilst there, at the age of twenty seven or eight, his talent for design and modelling was noticed by the firm's chief modeller, William Silver Frith , who believed that his designs showed 'all the feelings and instincts of an artist'. After a request from Frith, acceded to by Sir Henry Doulton, Pearce was promoted to the rank of designer in the firm and became known as "a gifted etcher, water coulour painter and illuminator" (Eyles). He also designed large scale works in terracotta. His most important work in the material was the colossal Doulton Fountain on Glasgow Green, which was originally designed as Doulton's principal exhibit at the International Exhibition held in Glasgow's Kelvingrove Park, in 1888. 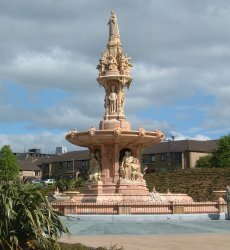 After the exhibition closed, the fountain was gifted to the city by Sir Henry Doulton and relocated to Glasgow Green, as the Victoria Fountain, in 1890. A celebration of Queen Victoria's Golden Jubilee, the fountain features statues, groups and other sculptural details illustrating Britain's armed forces and the peoples and produce of the empire. These were designed by Frith and made by his pupils in the modelling school at South Kensington, including John Broad ; Herbert Ellis and Frederick William Pomeroy . After years of vandalism and neglect in the late 1900s, the fountain was dismantled for restoration and relocation as part of the Glasgow Green Renewal Project in 2005. It is the largest terracotta fountain in the world. Work on a smaller scale by Pearce was also included in Doulton's trade displays in the exhibition itself, and he was possibly involved in the interior decoration of the City Chambers (Glasgow's Municipal Buildings), which was opened by the Queen in 1888. He also contributed to Doulton's displays at subsequent international exhibitions, including the Chicago World's Fair, of 1893, for which designed the firm's Pavilion. Pearce is credited with introducing Doulton's Morrisian Wares. He died on 2 October 1934. 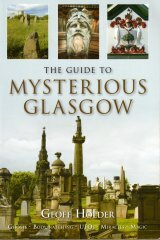 The team at glasgowsculpture.com is grateful to Rohan McKenzie, Pearce's Great Grandson, who supplied information for this biography.